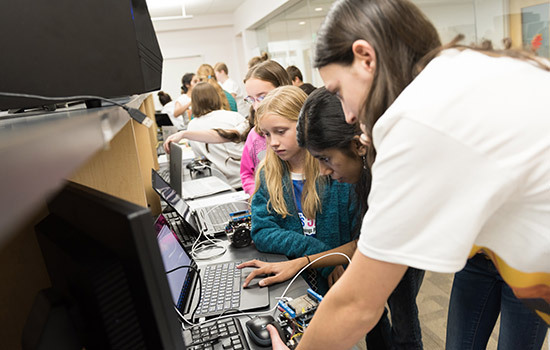 Computer Engineering volunteer Lauren Giannotti educated younger girls at the 2016 WE@RIT Engineering Open House. WE@RIT, a program dedicated to expanding the representation of female engineers, will celebrate 15 years on campus from noon to 1:30 p.m. on Saturday, Oct. 14, at the Gordon Atrium in Gleason Hall. The event, “WE@RIT: Solving the Gender Gap in Engineering since 2002,” is a part of Brick City Homecoming & Family Weekend and is open to alumni, current students, parents, faculty and staff. 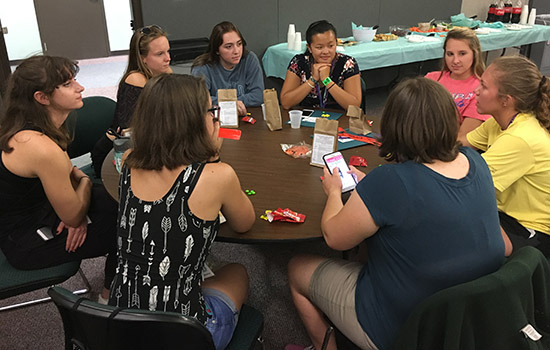 There will be light finger foods, conversation and a photo timeline that highlights the success of women from Kate Gleason College of Engineering. Members of the RIT engineering community are invited to mingle and meet other people interested in the goals of WE@RIT. Kathy Ehrlich-Scheffer, director of WE@RIT, said that the work the program does for the college is important because it cultivates a welcoming community for the women in the Kate Gleason College of Engineering. The program celebrates the strength of women in the college and affirms that engineers don’t all have to look or act a certain way. Kate Gleason College of Engineering is the only engineering college in the United States named after a woman. Gleason was an innovator and entrepreneur, and her technical abilities were astounding, particularly because she lived in a time where women could not even vote. Gleason’s legacy is an inspiration to the college to foster gender equality in the engineering field, and led to the formation of WE@RIT. In the time Ehrlich-Scheffer has been involved as director, she has seen WE@RIT grow in the number of women involved in leadership roles, the number of alumni involvement in programs in the college and the number of K-12 students attending community outreach events. In the next 15 years, Erhlich-Scheffer said she has high hopes of further expanding the reach of the program and continuing to increase student involvement. For more information about the upcoming WE@RIT event, go to www.rit.edu/kgcoe/women/event. First-year engineering majors met with their WE@RIT mentors for the first time during the pre-orientation program this fall.